I began collecting hockey cards again during the 2009/10 season, and I remember Upper Deck Champs really well. It was a product that was very similar to some Topps baseball and football products at the time. There really hasn't been a set much like Champs in hockey since it was discontinued. That's too bad, I liked it quite a bit! Champs is an eclectic mix of many things. You'll not only find hockey players, but also historical figures, items, and even animals. The cards come on an O-Pee-Chee-like old school card stock, which adds to the nostalgic and classic feel of the cards. Mini cards found one-per-pack was one of the main draws of Champs. Collectors could expect to find one mini card per pack. Both the mini cards and the standard cards had parallel variations, some of which were extremely difficult to find. Champs was a very polarizing product as some collectors loved it and others really hated it. I was one of those who really enjoyed the set, and wished it never left the shelves. I'm very excited to see what comes out of this particular blaster box of cards! What a fun break! This blaster had a wide range of interesting cards and even a hit! I was very pleased with the results of this break and enjoyed it thoroughly. There aren't too many cards per pack, but I was able to find quite a few different parallel variations of cards. The most common variation was the lighter blue/teal base card parallel. A few of those came out. In the mini cards, I got two rookie cards. The rookie cards come with a golden border and ornate design that really stands out. It was great to get some big names out of the mini card pulls from this blaster. 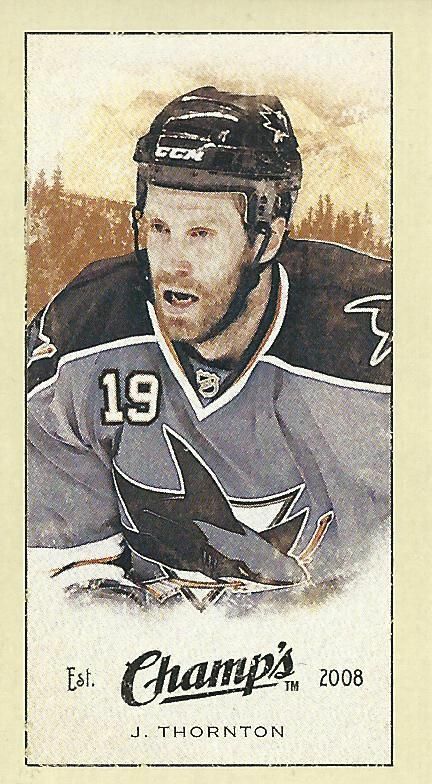 Kim Campbell, the chirostenotes pergracilis, and the Statue of Zeus were the three non-hockey related cards from the box. It's always great getting nice Sharks cards to add to the PC. This particular card is a great addition in that it is unique and I think looks very cool. This break makes me want to get more of these mini Sharks cards into the collection. It's so surprising to find a hit in retail! 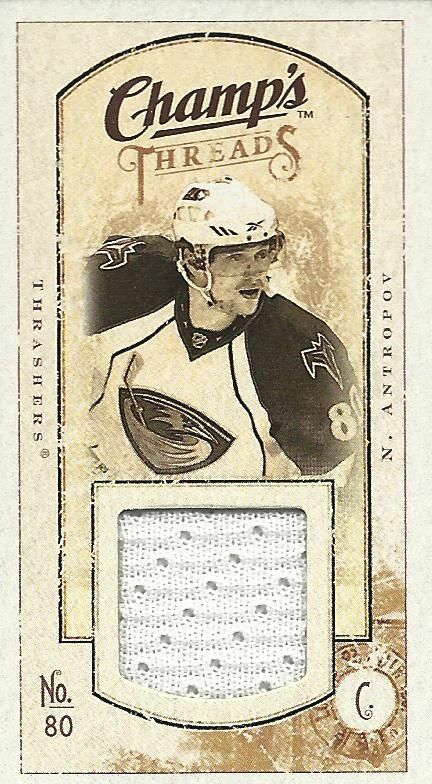 This mini card is of Nik Antropov when he was with the Thrashers. It's funny that I've been pulling more Atlanta cards as of late. 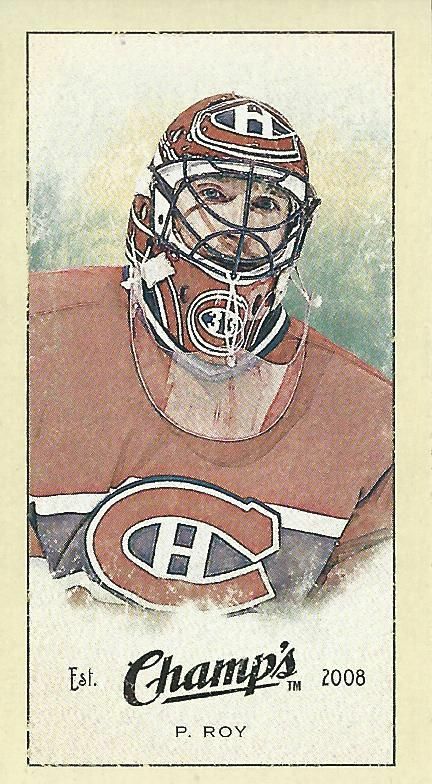 Usually the hit in the box is the top card, but I think this red back parallel of Patrick Roy tops that. Roy is a legend, and these red backed cards are not easy to pull! This is a very sweet pull. Champs is such a fun product. The original price was twenty bucks, and I probably would break down and buy it for that price even today... but luckily, they are heavily discounted online. For half the original price, these blasters are great fun to break and don't break the bank. If you're wanting to try a product that's a little off center, I would highly recommend opening up some Champs! Thanks To Share This Very Useful Information With Us.